This is a book authored by Mathew B. Crawford. The tag line says “An enquiry into the value of work”. When I was referred to this book by Narasim, I was not just asked to read; but also Narasim made it very clear that this is the book we need to treat as bible for our vocational training school. Without a second thought I bought it from flipkart. I took a lot of time to read this book; not that Crawford’s writing is complicated, but, Crawford’s philosophy behind his words made me think multiple times on each issue that is being addressed. All I can say is that this book will make a lot of difference. Mathew B. Crawford is a ‘thinker’, philosopher and a mechanic. He has a Ph.D in political philosophy from the University of Chicago and served as a postdoctoral fellow on its committee on Social Thought. Currently a fellow at the Institute for Advanced Studies in Culture at the University of Virginia, he owns and operates Shockoe Moto, an independent motorcycle repair shop in Richmond, VA. This book gives us the comprehensive view on how a 'Knowledge' based economy deteriorates itself to a mere ‘Information’ based economy by losing the focus and the foresight; How the education system is taking away the ‘thinking’ from ‘doing’ things; why there is a distinction between working with hands and working with mind (separating manual labor and the clerical jobs); why are people not connected to their own community and think they are lost in their cubicle? ; and what are the key aspects of solidarity and self-reliance? Crawford has also made a lot of references to other philosophers like Marx, Heidegger and Iris Murdoch. While I was reading this book, I also kept posting some bits on those aspects that I really liked. One can read it here. Also, most of his examples are drawn from his own experience of a mechanic, electrician and earlier to that of his cubicle life as a ‘knowledge worker’. His stories will make a delightful read with some good amount of fun if we relate it to our thinking on the related issues. 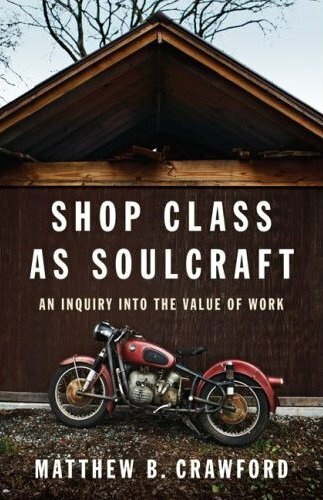 In the Introduction chapter, Crawford says that since 1990, the shop class has started to become a thing of past, as educators prepared students to become ‘knowledge workers’. I think we can very well relate to this given the jobs we are in and the emphasis that is given to the ‘knowledge worker’ role while hiring. He also says that the disappearance of tools from our common education is the first step toward a wider ignorance of the world of artifacts we inhibit. This book also gives us a clear story behind the distinction of white collared and blue collared jobs through the education system that was introduced. People were trained for theoretical work separately and ended up in clerical and managerial roles; while the others who were doing the manual work were made to follow what is to be done there by creating the distinction. Even though most of the aspects revolve around the American futurism, it is also applicable for all other knowledge economies of the world. It is the vision of the future that leaves the material reality and glide in a pure information economy. Even I feel, like my other friends that what we are imparting is just mere schooling than the education itself. The next chapter, A Brief Case for the Useful Arts, begins with how shop classes were removed from the schools. The fact that the shop class was expensive and it could be easily replaced to pay for new computers, to promote the computer literacy. He also describes on the psychic satisfactions of manual work by comparing his and many others experiences with the manual work. How both ‘individual agency’ and the ‘competence’ contribute to the productivity. I can think, what would I say if someone asks me how productive are you at work? What would I answer? Or what would you answer? If the answer is nothing more than a few words of ‘I-completed-all-my-work-on-time’. But I can never say, at the end of my work “And! there was light” – like an electrician can or ‘the car now runs’ – like a mechanic answers. Are we connected to our own stuff? While talking about the cognitive demands of the manual work, he says – given the intrinsic richness of manual work, cognitively, socially, and in its broader psychic appeal – the question becomes why it has suffered such devaluation as a component of education? I think only culture and the history can help us understand the issue better. The Arts, crafts and the assembly line section of the chapter draws our attention to the origin of the basic issue; that is the Smith-Huges act of 1917. It brought two rationales for the shop class, Vocational education and the General education. The two track educational scheme severed the cognitive aspects of the manual work from its physical education. It was a complete separation of thinking from doing. Eventually, this entails two big errors in the whole system. 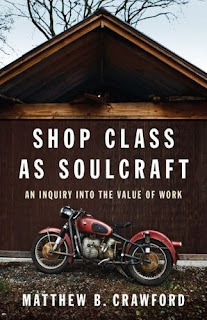 First, it assumes that all blue collar work is as mindless as the assembly line work, and second, that white collar work is still recognizably mental in character. This made me understand much on the distinction that got created and what was the process of separation of thinking from doing. It is as simple as why do we need two separate parts to operate simultaneously? One to operate mind and the other to operate hands. Why can’t there be one single body doing both? The next chapter is the details on the most critical aspect (to me and to the author of course) - The separation of thinking and doing. This chapter basically deals with the dichotomy of the mental and the manual. The author says, wherever the separation of thinking from doing has been achieved, it has been responsible for the degradation of the work. This chapter also details on the degradation of both white collared and blue collared works. With the introduction of the new scientific management and the distinction that was created between the highly skilled workers and the manual laborers, the focus of the education and the training has been completely changed. It is like a manual worker is no longer able to plan his layout on his own. There is a separate department created for doing brain work. A manual worker has to depend on someone else’s brain to do his job. Degradation of white collared work has also been extensive in terms of the new way of thinking that has taken over the actual methodologies. It is like creating the artificial intelligence on which a person has to depend upon to do his job. And a tag of knowledge worker has been given to a person who just uses mere information from elsewhere to do his job. Expert systems have been created to support the employers to an extent where they need not worry about the individuals decision making processes. Everything is set and the employees have to just follow these systems to arrive at a decision. So the role of such systems is “transfer the knowledge, skill and decision making from employee to employer”. In the chapter – To be master of one’s own stuff, he starts with saying, “spiritedness, is allied with a spirit of inquiry, through the desire to be master of one’s own stuff. It is the only prideful basis of self-reliance.” In this chapter there are a lot of things that he illustrates by taking examples of several trades, his own experience and some other’s philosophical ideas. It is as simple as a true mechanic understanding what the real problem with the bike is? While, there are a lot of people who do not master what they do and end up doing dirty job. He also gives the clear understanding of what an Individual agency is and how it needs to function vs. the autonomy. What are the expectations of the people now with respect to the technology changes and how the companies are misleading people with their new techno stuffs added to their products? It is like, for example, having an electric starter for my bike might make it easier and comfortable for me to use it. But when there is a breakdown, there should be some easy way to fix it manually as well. But unfortunately the new technology does not support people who work on them manually, like mechanics. If the technology does not support the people who play with them, how good a technology is that? Or is it just those companies are playing as per the consumer behavior? Crawford has illustrated these with some of the best examples in this chapter. The fourth chapter – The education of a Gearhead is an absolute pleasure to read. It details on the ‘diversity’ in the education that we are seeing, the different kinds of work that are existing, the mutual entanglement between the intellectual qualities and the moral qualities. With a lot about his own experience and his philosophies behind all his decisions, he has tried to reach out to us in this chapter. It majorly highlights on the experience, the learning that we have since our childhood, the mentor factor, the basic fundamental theories that we apply in our daily work, the personal knowledge that comes with the experience which eventually helps us in seeing a problem better and to the perfection, how to see things clearly or unselfishly and many more. To read about his personal examples in this chapter is a lot of learning for us. He makes us think. The next chapter emphasizes on the fact of being progressed from an amateur to a professional. What exactly happens when we seriously take our amateur experiences forward into our careers? This is the chapter on – The further education of a gearhead. This chapter deals more about the author’s experience on his decisions to set up his mechanic shop, the story behind the same, the initial struggles and how he makes himself better with the problem. More than anything the approach he takes to solve any problem or learn from the same is what impressed me. It is a kind of feeling that gives enough confidence to say or do that is ‘anything is possible’. The sixth chapter is on – The contradictions of the cubicle. This is one of my favorite chapters in the book. Mainly because, I work all the time sitting in a cubicle and the thoughts that comes to my mind is no different from what the author would have experienced. Basically Crawford, before becoming a bike mechanic, will be a knowledge worker in an Information access company. This chapter basically starts with his experience and draws our attention to what exactly we do sitting in a cubicle and what are the challenges we encounter when we do not like to be sitting in a cubicle. Rather, it is like asking ourselves the question, Am I doing the right thing every day? Or am I being useful to the world? This chapter also talks about an important issue on – what college is for? It is a known fact that if we pursue the higher education for the sake of career, it would turn out to be a complete mistake. I keep saying this often, what we study is not related to what we are working now! and that appears to be true at all the places that I have observed. What we get in the higher classes is just an extension to the compulsory schooling. And even though our marks do not matter to most of the companies, the eligibility criteria they set through the institution would read through the marks. It is very simple: if a college has good students with good marks, more campus selections happen. So where did the ‘your scores doesn’t matter’ philosophy go? I feel it is the educational institutions that are doing this to make them look good in the society irrespective of what the skill imparted to a student is. I am now against to the whole concept of campus recruitments. Education institutions should just produce students who are employable and who can survive on their own. They should not help a student getting ‘some’ job. Rather, student should be able to choose the kind of job him /her ‘wants’ that goes with their skill and talent. One more important issue in this chapter that is addressed very well is the concept of ‘team work’. I feel the whole idea of team work is being implemented in a wrong way in organizations. They are trying to build stronger teams rather than stronger individuals. I think if the individuals are stronger in the team, the team will be much stronger. But seldom have we seen in organizations who emphasize the idea on building a stronger individual rather than a stronger team. It is just that the organizations focus on getting the job done. They are purely job-centric rather than individual-centric or growth-centric. I have noticed in many teams that the individuals do not even care if the work is not getting done. They will just think that it is a team work and it does not matter if one does not contribute to the same. This is the way we are progressing. It is the responsibility of the employers to have such a culture where in they contribute to the organizations by creating stronger individuals and then the team. If not, the one who is contributing individually will lose the spirit of contributing to the team. The chapter ends with a neat interpretation of – The crew versus the team. He says, On a crew, skill becomes the basis for the circle of mutual regard among those who recognize one another as peers, even across disciplines. The seventh chapter is on the - Thinking as Doing. Here the author talks about the connectivity that we can have with our own mind and our own hand that we work. This way there is a completion in what we do meaningfully. This chapter explains us in detail with the examples of firefighter, mechanic, technical writers and a chess master, drawing comparisons with what might happen with the ‘intellectual technology’ being implemented to deal with their kind of work. It also gives us a clear understanding on the ‘tacit’ knowledge one has to posses in dealing with the respective jobs. The eighth chapter is about – Work, leisure and full engagement. After reading this chapter, I just asked myself a question – am I connected to any community at my work? Or rather, is my work being accepted by any community? Is there a community around me? Ok, the reason for me to come up with such questions is that the satisfaction for any work we do is achieved only if there is a community in which we work. A mechanic/electrician is connected to his own community and his work is rewarded with in the same that gives enough satisfaction and recognition. They see their community. Where as a factory worker in China who stitches a dress for an American kid, will never know what his community is and his work will never be rewarded unless the company does so. Likewise there are many more interesting examples in this chapter. Also, very often, whenever I am free, why do I think of doing my personal activities in priority to get myself satisfied? It is like, ok, this weekend; I will be hiking up a hill that makes me satisfied about the whole week. If there are no such personal activities, we tend to get frustrated. Why? Because, it is the leisure activities that comes first to our mind when we think about intrinsic satisfactions – hobbies that we enjoy. It has become very common to locate one’s ‘true self’ in one’s leisure choices. There is a complete disconnect between the work life and leisure life. When it comes to work life, perhaps, only money that we earn is what gives us a bit of satisfaction (atleast in majority of the cases). This is what happens for all those who work in cubicles. But not for those who think their vocation as their life. Those who depend on vocations like mechanic or electrician, there is nothing like leisure activity. They enjoy doing their work and think that as fun at the same time. They will not get bored of fed up of what they do. Finally in his concluding remarks, he talks about the solidarity and aristocratic ethos, Importance of failures, and about the stronger individual agencies. He says, what we really want is free men. Having a few around requires an economy in which the virtue of independence is cultivated, and a diversity of human types can find work to which they are suited. The result is that opportunities for self-employment and self-reliance are preempted by distant forces. Also a great emphasis being on protecting the space for entrepreneurship. And to achieve this what needs to be done is that we need to start giving more importance to the vocational education, imparting one skill in a person for self-reliance, connecting the mind and the hand, creating a stronger individual agency rather than the autonomy and connection with the community. This book surely will be one of the great references to the vocational education system in any country. Hopefully we will be able to follow some of fundamental concepts that are discussed in the book. PS: Please feel free to post your feedback in the comments section. Thank you. Bravo! You have outdone yourself. Reading your detailed book review was like reading an annotated version of the book on the eve of the annual exam for fear of total ignorance if a question is in the exam. You have captured the essence of the book admirably. The separation of the manual from the mental is so spurious that it makes an adult cry. It is my hope that after reading your outline many other people will take the time to read the brilliant encomium to manual work by Crawford. After all, it is only 238 pages of text. Easy to read but requires reflection to understand the full import of the ideas contained. Hope the book is translated into the 17 official languages in India. We need to restore dignity of labour in India more than in Europe or North America. Crawford has done an excellent job. You have done a commendable job of summarizing his work. It is really thought provoking ! I really wish to read this book. However, i feel your long review was helpful for those who want to get a glimpse of such a genre and may not end reading but when they see this book they would remember this review and pick up to know more. Atleast I would do that. Sorry for the late reply as I was out of station! Very well described and a thoughtful writing. Feeling like to read the book. Thanks for posting the blog:). Get throughout touch with 1-855-637-4055 for a experienced tarot readers. I'd appreciate spend some time for you to let an individual know information on MY PERSONAL most current the top medium content web page. I have been previously functioning truly difficult, many thanks for enabling me to discuss the actual along with you.